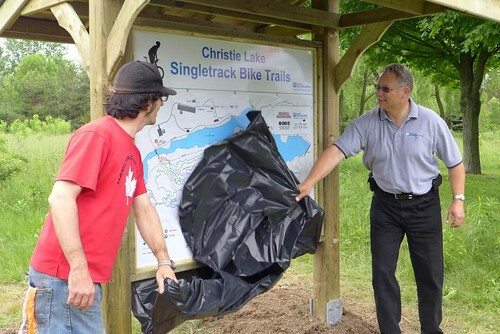 Thanks to all the staffers, volunteers and supporters who made today’s grand opening of the Christie Lake trail system a reality — click the image to see more action from today’s event. This entry was posted in News on June 8, 2013 by rfaulkner. Long-time HCC friend Naomi Cermak, whose story is incredibly inspirational, has made it to the finals in the Kona Inspired contest! Please keep voting as many times as possible. Learn more about Naomi and her struggle here and here. This entry was posted in News on June 6, 2013 by rfaulkner. MTB Event Cancelled, Bike Fest Still on! Due to the strong likelihood of rain tonight, the MTB TT will be cancelled. However, if you’re still itching to come see the trails, please join us this Saturday for MEC Burlington Bike Fest where the HCC will be hosting a grand opening of the Christie Lake Conservation Area trails! Check out all the festivities on the event’s Facebook page. Shelly McKee led the S3/Master & Junior women for most of that group’s race with a 30 sec lead but the peleton got swept up to her when overtaken by M3 Men. She was edged out by just 6 seconds! This entry was posted in Results on June 3, 2013 by rfaulkner. May brings with it the return of the HCC’s MTB events! Join us this Thursday in the West parking lot at Christie Lake Conservation Area where we’ll meet at 6:45 to head out to the freshly prepped Green loop. Riders will complete the loop once in each direction and the times will be added to determine the results. This entry was posted in News on May 13, 2013 by rfaulkner. Lake of Bays Road Race turned out to be a brutal race, Sunday, May 12 in Huntsville. It was a tough race that felt like it had endless hills, not just the 401 meters elevation gain the tech guide claimed. Wind and cold made it feel well below 0C, with constant heavy flurries and sleet. Ouch! Numerous male riders turned back. At least three women suffered hypothermia, one ending up in hospital. For those who finished hats off to the brave! Club Results Ready for 2013! Are they’re off! The first time trial of the season at Indian Trail enjoyed beautiful weather, as HCC members tested the fruits of their winter training. You can find the Club Results – 2013 page here, located under the Events dropdown tab. Keep an eye on the spreadsheet to see who’s hot this year! This entry was posted in Results on May 8, 2013 by rfaulkner. The 10th annual Brian Smith Charity Ride, in support of the Halton Trauma Centre, YMCA Strong Kids and the Brian Smith Memorial Scholarship Fund (which helps students at Nelson High School) will be held on Sunday May 26th, 2013. The course follows the shores of Lake Ontario from Hutch’s on the Beach to the historic town of Niagara-on-the-Lake. This charity event offers three separate distances; 52km,80 km and 140 km( up the escarpment and through the Vineyards of Jordon to Niagara-on-the-Lake. This ride attracts serious and recreational cyclists on safe roads with support vehicles and rest areas. This ride is increasingly popular with road riders, triathletes of all levels who are looking to get their season off to an early start in a fun and friendly event.This also a perfect warmup to other events like Ride to Conquer Cancer( 200km). This entry was posted in News on May 8, 2013 by rfaulkner. I’m sure many of you are aware of my ambition to one day qualify and compete at the Kona Ironman World Championships. So far, I have completed 8 x 70.3 Ironmans (including 2 trips to the 70.3 Ironman World Championships) and was waiting for the perfect time to perform the perfect Ironman race and get to Kona. Well unfortunately, I don’t know if I have time to keep waiting around so I decided to enter the Kona Inspired competition. With your vote (and judge’s decision) I hope to be one of the people chosen to represent the Kona Inspired team and let the world know that “Anything is Possible” by competing at the Kona Ironman World Championships in October, 2013. Urgent! There is only 24 h left to vote (ends 23.59 EST Tuesday May 7) so please, please, please, take the time and vote now and please, please, please share with your friends. (Heading back to the hospital now for more scans). This entry was posted in Supporters on May 7, 2013 by rfaulkner.